Obesity , a condition of being overweight, should be taken care very seriously as this condition can lead to various other diseases like Type 2 diabetes, high blood pressure, Osteoarthritis, Infertility etc. and can be life threatening. The primary approach to treating obesity is to reduce excessive body weight. This can mainly be done by dieting, maintaining a healthy lifestyle and exercising regularly. Besides these, various therapies like behavioral and drug therapy have also proven to be useful but short –term weight loss methods and so they cannot be seen as permanent solutions for dealing with obesity. Surgical management is the answer for morbid obesity. There are surgical procedures, coupled with behavioral modification, that facilitate long –term weight loss and offer a permanent solution. Laparoscopic surgery is one of the procedures that help in getting rid of obesity. 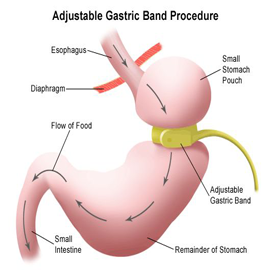 Department employs latest technology in treating patients with Obesity like Single Port Surgery. Department of Laparoscopic & Bariatric Surgery at Dr Jivraj Mehta Smarak Health Foundation (Dr Jivraj Mehta Hospital)s offer following surgical options for treatment of obesity.